There are many good reasons why the Mazda MX-5 is the world’s best-selling sport cars: more than a million, in fact. Yet it’s not just about the numbers of this cracking roadster sold by Mazda, there are the second, third, fourth and more owners who have enjoyed this fun machine and the many who now cherish earlier models as classics. Now, I have to declare an interest here. I’m onto my third MX-5. The first was a scruffy Mk2 (or NB in Mazda-speak), while the second was a sound Mk1 (NA) that needed paintwork. The third is a keeper as it’s also a Mk1 but was imported from Japan with no rust and has been completely restored. It’s also been treated to a couple of subtle upgrades such as different alloy wheels and a sports exhaust for a bit more power and zing. There’s also a colour-coded mohair hood. 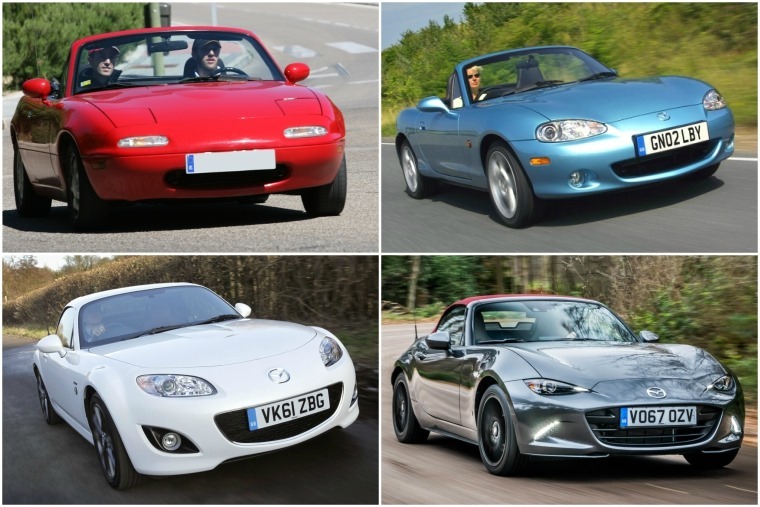 As you can guess from that, this writer is a big fan of the MX-5 in all its guises, but as a road tester I’m also not blind to some of the faults of the different generations. For instance, anyone over six feet tall is going to find it a squeeze to fit in the first two generations, while the early third incarnations were not as sharp to drive as we’d come to expect of this class-defining car. You could also point the finger at Mazda for not delivering more powerful versions of the MX-5 when the chassis has always been so clearly capable of taking it. Yet, that has also been a strength of the MX-5. It’s provided a canvas for owners to create their own interpretation of what a simple two-seat roadster should be, and the aftermarket tuning and styling industry was quick to latch onto this. 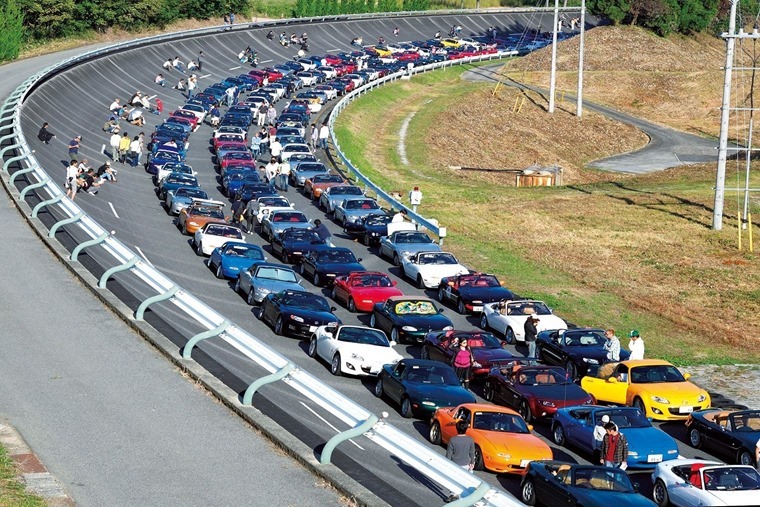 Upgrading and tuning MX-5s is now a huge global business. However, Mazda has decided to get in on the action itself with the current fourth generation model (ND) with a facelift. You’ll have to look very hard to spot any changes in appearance, but under the bonnet the 2.0-litre petrol engine gets a 25bhp boost. That’s a significant upgrade for Mazda as it’s traditionally left the engines well alone and put the focus on handling and steering purity. 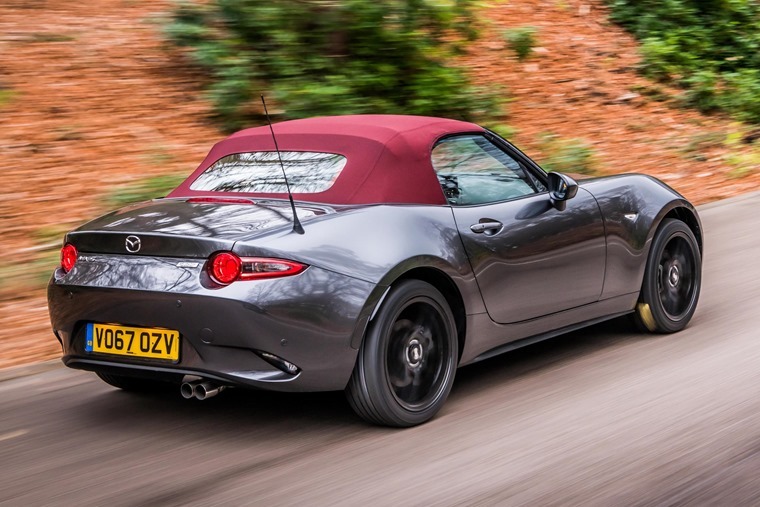 It’s a shrewd move by Mazda as it offers existing MX-5 owners of the present car somewhere to go for their next fix of open-top fun. While many have bought into the MX-5 as a new car, plenty also step away after the usual two- or three-year new car ownership period in search of something more potent. Now, Mazda has that ready and waiting and it’s on sale in the UK this autumn. The 1.5-litre engine in the current MX-5 also gets a power upgrade, though it’s all of 1bhp. Still, this is such a sweet engine to use that you don’t worry about the deficit in power and instead make the most of the delightful chassis. When you can get lease deals as keen this, who cares about being a second or slower from rest to 60mph? There are also a couple of special edition models on offer at the moment in the form of the Z-Sport and Sport Black that offer plenty of extra kit. More of a conundrum in this writer’s view is the choice between Convertible and RF models. For me, the soft-top is the one to have, but with the previous model it was the Roadster Coupe (RC) that made up 80% of sales. With the RF, the roof arrangement is very different to the RC’s and is more of a targa than full drop-top. That spoils some of the fun in my view and there’s also quite a bit of wind turbulence in the RF that you don’t notice or worry about in the Convertible. As the Convertible and RF share the same chassis, there’s no benefit in choosing the RF for a stiffer platform to improve handling. 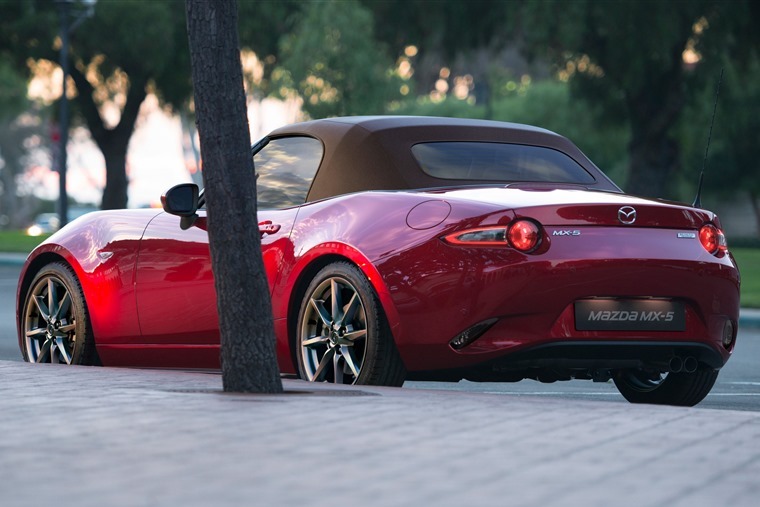 The MX-5 was designed as a roadster from the outset, so the body is plenty rigid enough. That’s the case with all iterations of MX-5. A strong base allows the suspension to get on with its job of soaking up rankling road surfaces. In turn, the Mazda can flow along lanes, ably assisted by direct steering. That, in essence, is the basis of all good sports cars and the Mazda nails it perfectly. The inspiration for this came from the original Lotus Elan and there are clear styling cues in the first MX-5 to the British roadster. 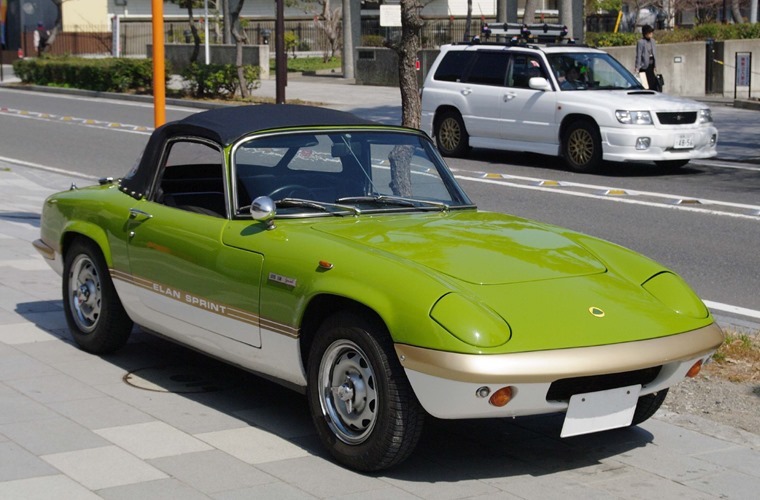 It should also be pointed out Mazda’s engineers were also inspired by the little known and sadly underfunded Stevens Cipher that could have flown the flag for UK roadsters at the start of the 1980s. 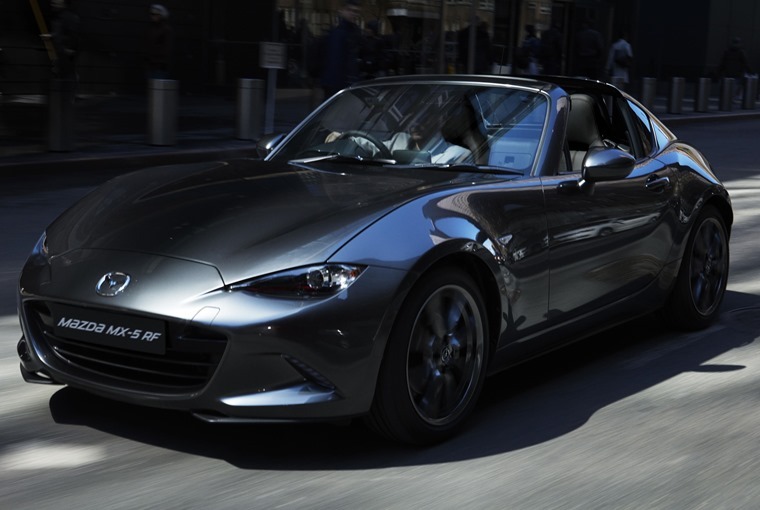 It was left to Mazda, then, to resurrect the roadster in 1989 when the rest of the motoring world was cooing over hot hatches and turbos and four-wheel drive. The Japanese firm took a big gamble as the MX-5 was signed off for production based on the hunch of the small team behind the car. Yet it proved an instant success across the globe. Worldwide appeal is hard to achieve, yet the MX-5 managed to pull in buyers for many different reasons while sticking to a single-minded approach. Some loved the looks, others the fact it was a compact roadster like the MGs of a previous era, while plenty were hooked by the way it drove. Mazda has not altered this formula from day one and that, more than anything else, is why the MX-5 has attained its position of best-selling sports car of all time. It’s managed this in less than 30 years whereas the Porsche 911 took 53 years to notch up one million sales. Given the way MX-5 sales continue from year to year and how Mazda refines the car while keeping all of the important fundamentals in place, there’s little chance of another car toppling it. Of course, that ubiquity might put some off and there are plenty who point the finger and say the MX-5 is a poser’s car, not a real sports car. You can’t please all of the people all of the time, it’s true, but the MX-5 does a better job of it than any other sports car on the planet.